Anna Elisabeth Stillinger of Trenton, SC and a rising senior at Winthrop University majoring in Early Childhood Education has been named a Haggai Scholar for 2015-16. The Haggai Foundation of High Point NC recognizes non-traditional students who are outstanding in the fields of elementary and early childhood education. The scholarship is awarded to students who have shown dedication and hard work in the classroom and have excelled academically. The Haggai Foundation scholarship provides a monetary award of $7,000.00 to defray the cost of education. 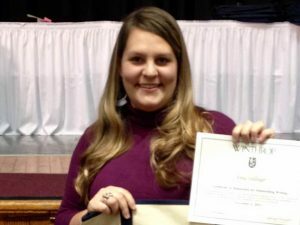 Ms. Stillinger has also been awarded the Mary Flowers McAlpine Scholarship for Early Childhood Education for the 2015-16 academic year. This award is based on GPA and financial need. Anna will graduate in May 2016 with a BS in Early Childhood Education.